Bonnier Rights Finland » Alma! Alma! is a rich, expressive novel about art and the world we live in, and the criteria by which we measure humanity – in particular a woman’s worth. Its reality has space for a lawyer secretly dating a young immigrant as well as an exotic dancer who lives her glamorous life in the pages of the tabloids. 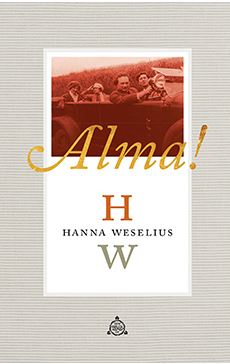 It is Vienna, 1907, and Alma Mahler is sitting at a piano. Her fingers run across the keys, and she sings. But the grand piano’s note stand is empty. This song was never written. Not a single note of it was published. Not a single trained soprano ever sang it. Elsewhere in the world, which is the same and yet of a totally different era, 234 Nigerian schoolgirls disappear. Armed men come to take them away in the middle of the night. Aino reads the news in the paper and stops, sighs – is there anything she could do about the brutal reality of distant lands? She’s an artist, all she knows how to do is draw, and yet the images that flood into her mind gnaw at her. On her way to her studio, Aino thinks about a woman’s contours and gets lost watching a girl apply makeup in the metro, rust-coloured blush. Hanna Weselius collates her uniquely enchanting novel from fragments, the shards of mirrors in which we see reflections of many images of women. The stream-of-consciousness text immediately sweeps us up and along. Times, places, and perspectives change; who is speaking matters less than what is seen and how it feels. Putting the implements of beauty to work, Alma! bores critically into the reality surrounding us and into that bottomless, limitless other reality that each of us carry inside.